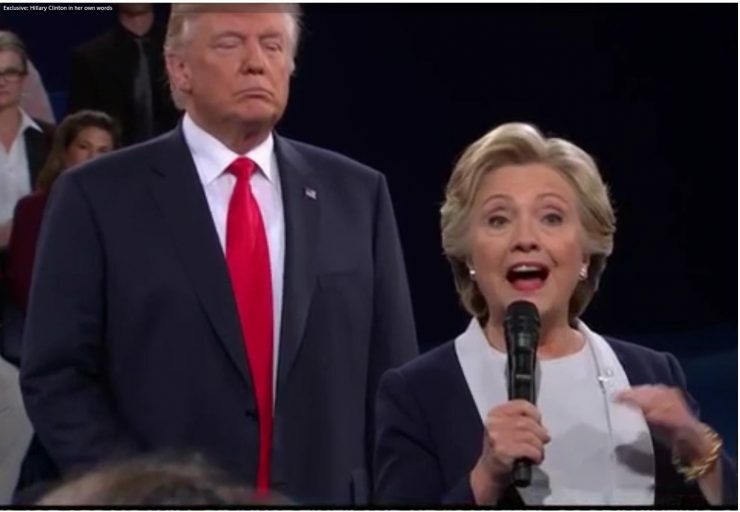 © Kalhan Rosenblatt | Wednesday, Aug. 23, 2017, image made from a video provided by Morning Joe News shows Images: Trump & Hillary during presidential debate in late 2016. The first excerpts from Hillary Clinton’s highly-anticipated upcoming memoir revealed Wednesday that the Democratic presidential candidate said her “skin crawled” during a debate with Donald Trump. In audio clips of Clinton reading from the book, “What Happened,” which were first obtained by MSNBC’s “Morning Joe,” Clinton recounted her thoughts as her Republican rival stood behind her during the second presidential debate. 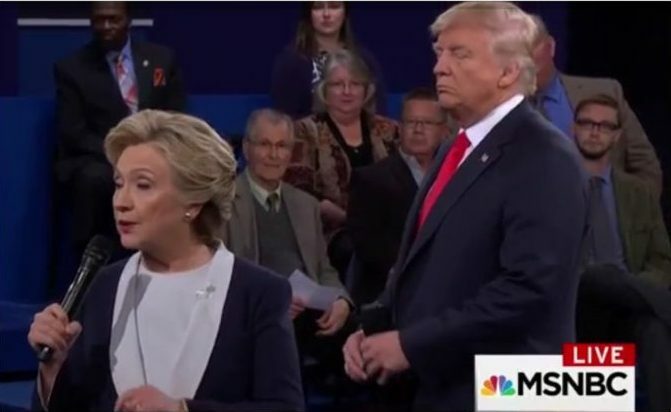 But, in hindsight, Clinton wondered if she should have taken the time to tell Trump off for following her. “It certainly would have been better TV. Maybe I have over-learned the lesson of staying calm, biting my tongue, digging my finger nails into a clenched fist, smiling all the while, determined to present a composed face to the world,” she said. Clinton’s memoir is slated to be a postmortem on mistakes she made along the campaign trail and the “devastating” and unexpected loss to President Donald Trump, according to a press release. “In this book, I write about moments from the campaign that I wish I could go back and do over. If the Russians could hack my subconscious, they’d find a long list,” Clinton said in one part of the book. The excerpts give a small window into what readers can expect once they snag their copy on September 12. In an earlier section of the book, Clinton explains that this memoir will not be a comprehensive account of the 2016 race. “That’s not for me to write. I have too little distance and too great a stake in it. Instead, this is my story. I want to pull back the curtain on an experience. It was exhilarating, joyful, humbling, infuriating and just plain baffling. Writing this wasn’t easy,” Clinton explained. She goes on to say that she felt millions of people were counting on her as she ran for president, and she feels she let them down. “What Happened” is being published by Simon & Schuster.